Alaska's Tongass National Forest is the largest national forest in the U.S. and is the greatest repository of our nation's old-growth forest, which has declined precipitously across the continent. The Tongass encompasses much of the Earth's intact, temperate rainforest and provides important habitat for Pacific salmon, brown bears, wolves, black-tailed deer, bald eagles, marbled murrelets and other fish and wildlife species. The fish and wildlife resources of the Tongass support a thriving tourism, fishery and recreation economy as well as an important subsistence way of life. Sen. Lisa Murkowski has introduced legislation to repeal the 2016 Tongass Land Management Plan amendment by attaching a rider to the draft Interior and Environment Appropriations bill. Just last month, the senator announced she would explore whether to use the obscure Congressional Review Act to erase 2016 management plan amendment and prevent the same or "substantially similar" plan from being written in the future. I carefully reviewed the revised Tongass plan during its planning process last year and responded to the Forest Service that it was deficient because it continued the practice of unsustainably clearcutting old growth and targeting the rare big-tree stands that provide the most valuable fish and wildlife habitats. With that said, today's revised Tongass plan is an improvement over the past plan because it identifies important fish and wildlife habitats for conservation and it proposes to phase down old-growth logging. Regardless of which legislative mechanism is used, Sen. Murkowski's drive to return the Tongass to the 2008 plan is very concerning because it ignores the best available science and the clear consensus of scientists that clear-cutting of old growth needs to come to an end. For nearly half a century, the economy of Southeast Alaska was underpinned by clear-cutting old-growth forests to provide timber for pulp and lumber mills primarily for export. Today, fishing and tourism make up the bulk of the region's economy and the timber economy is but a fraction of what it was from the 1970s through early 1990s. This decline was driven in part by the high costs of logging in Alaska, distance from markets, and the fact that the best, most economical old growth had been disproportionately logged. The big-tree old growth was always rare on the Tongass and today it is much reduced. Unfortunately, those productive forest sites also provided some of the most valuable fish and wildlife habitats. This high-grading of the best old growth is not unlike selecting just the M&Ms out of a bag of trail mix. The peanuts and raisins that are left do not represent the diversity or value of the original mix. In 2003, two former Forest Service chiefs, Mike Dombeck and Jack Ward Thomas (both scientists), declared in a Seattle PI op-ed, "It's time to stop fighting over what little old growth remains unprotected. … It is time to move beyond the board feet of timber debate … Recognizing that harvest of old growth from national forests should come to an end is a good start." Today, the Tongass National Forest is the only national forest where clear-cutting of old growth is still common practice. 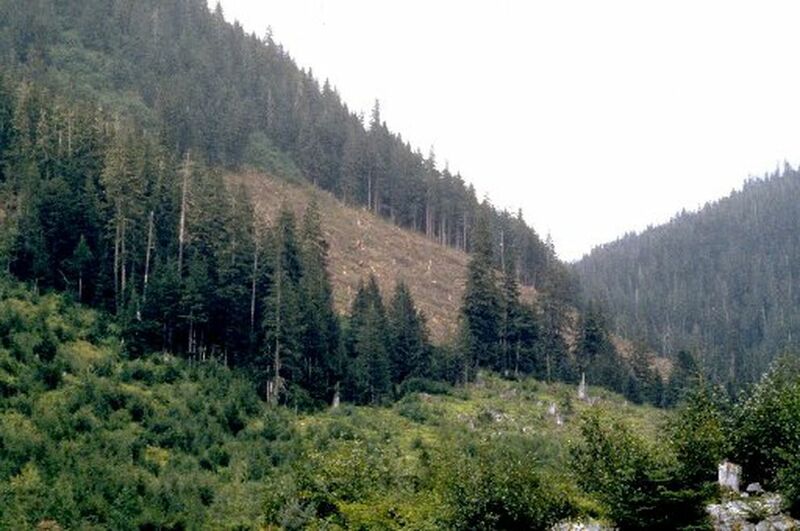 In May of 2010, the Secretary of Agriculture announced a "… transition quickly away from timber harvesting in roadless and old-growth forests …" on the Tongass. Unfortunately, that transition has not yet occurred. In 2014, 78 scientists led by former Forest Service chiefs Thomas and Dombeck sent a letter to the president recommending "… a National Old Growth Policy that fully protects the remaining old-growth forests on national forests …" The following year, seven scientific societies representing more than 30,000 scientists sent a letter to the Secretary of Agriculture stating, "The Tongass National Forest has the greatest abundance of old growth remaining in the nation … we request that you (1) provide additional guidance to the Forest Service to end clear-cut logging of old-growth forests during the forest plan amendment process, and (2) ensure that the timber industries' transition to second growth is completed as rapidly as possible, ideally within the next three years." The amended 2016 Tongass plan is not perfect: it allows too much flexibility to continue old-growth logging in perpetuity. But it does affirm the call for a transition away from old-growth clear-cutting and identifies and protects ecologically important watersheds. It is better to continue forward under the amended Tongass plan rather than go backwards to the 2008 plan and lose what positive momentum has occurred. The opportunity for future generations to sustainably use Southeast Alaska's valuable fish and wildlife resources depends on science-based conservation, not politics. Dr. John Schoen is a retired wildlife ecologist with 40 years of research and conservation science experience in Alaska, including the Tongass Forest. He is the co-editor of the book "North Pacific Temperate Rainforests: Ecology & Conservation."